Taking the customer’s money is only half the story of retail. In fact, giving the money back is threatening to become the primary activity in an online world where the customer is now calling the shots. A landscape has formed where the customer returns at will, and the retailer picks up the bill. Buying many sizes and styles with the intention of returning the majority is acceptable behaviour for Generation Z’s, Millennials and older customers. The panacea of online retail can soon turn into a reality nightmare. But product returns don’t have to be all bad news. Ironically by making it easier than ever to return product, you can ultimately drive more sales. Returns are an opportunity to build customer loyalty and patronage. For pure-plays and omni-channel retailers alike the answer comes from a carefully planned retail strategy, and a business model that turns product returns into product sales…not product sales into returns. Let’s face it. It’s not often you talk about online without mentioning Amazon. This is no exception. They are remarkably innovative and a lesson to us all, as always. 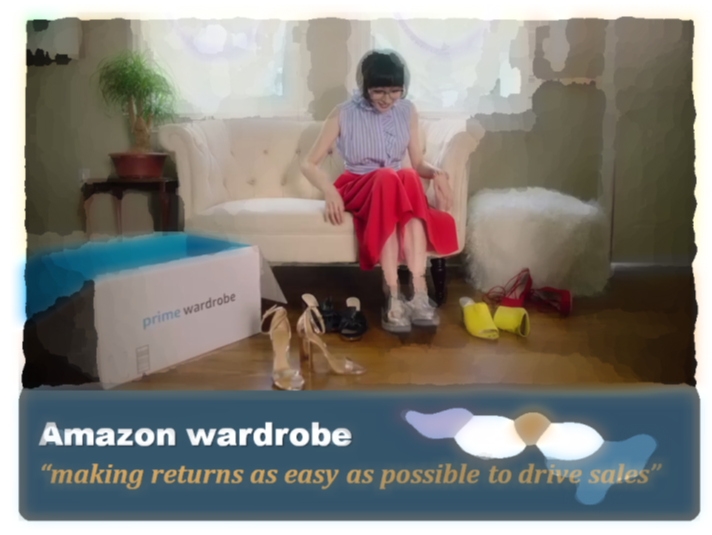 Prime Wardrobe is Amazon’s new answer to the dilemma of product returns. It builds product returns into a profitable online retail model. A negative is turned into a positive through a combination of precise customer analysis and imaginative thinking. Prime customers can choose between 3 and 8 items. They don’t pay. The box arrives. The customer has 7 days to decide what to keep and what to return. There are incentives. The more value you buy the more you save. 5% of the value in a recent promotion. The re-sealable box comes with a pre-printed return label. Delivery & return is free. The process is as seamless as you could imagine. The outcome is that Amazon sells more than it would ordinarily by allowing customers to order and try on more products. It also doesn’t have to process payments and re-process returns. In addition, the unsold product is out of inventory for a minimum time. It is quickly available again for others. The customer has the easiest-possible way to try, buy and return. Amazon, by making the returns process as easy as possible, encourages more sales than ever. Away from the uniqueness that is Amazon. If you want to benefit from product returns as an omni-channel retailer then firstly do your homework. Take a hard look at how, why and when customers want to return products to you. Build your business model around what your customers want to do. They will return the favour many times over. Hopefully you will have your own data and analysis. But here are some interesting facts to support the point, published in a recent report, courtesy of Optoro. 97% of customers will come back to you if they have a positive product return experience! Clearly it is worthwhile in the longer term to make returns as easy as possible. 75% of customers return at least one clothing item over the holiday season! 94% of customers return within a month of buying. 52% within the first week! 87% of customers return to physical stores! 59% of people buy online and return to stores! So, lesson number one. Don’t swim against the tide! Even with the best assortment in the world, customers will return items. They will return promptly but not as quickly as you would like. That’s a lot of inventory out of circulation and unavailable for re-sale. Lesson number two. Your physical stores are emerging as a major destination for returns. Facilitate this. In fact, one of the ways to minimise falling store footfall is to encourage the returning of products to your physical store portfolio. Lesson number three: Your physical stores have the potential to drive sales and profit significantly from customers returning product. It is not beyond reason in a seamless omnichannel business that physical store footfall will be primarily driven by customers returning online purchases. Leverage the value of your physical stores. Turn a return into the opportunity to buy more. So, where’s the problem with returns? The problems are partly due to a historic sales focused mind-set, archaic payment and refund procedures and systems and a severe lack of a customer focused imagination. If your returns are part of the modern way of doing things. Where choice comes after purchase and delivery, then join the club. Accept the world as it is. Go build your business model to capitalise on this new phenomenon. If your returns are because the customer isn’t satisfied with the product. It isn’t what is expected, the quality is poor, the photo flatters it, the shape is wrong, the fit inaccurate then that’s different. That’s nothing to do with technologies, online shopping or the new customer. This is because of a poor product. You’ll need to look further into your business, your buying and merchandising and manufacturing to solve this. Ultimately, you’re a retailer. And there’s no excuse for being a poor retailer…whatever the channel. Do you understand why, how and where your customer is returning product? Do you facilitate product returns with a longer-term view of sales & profit?